Napa might be the better known wine county, but when it comes to cycling, neighboring Sonoma is the favorite amongst those in the know. Located just 60 minutes North of the Golden Gate Bridge, the charming village of Healdsburg couldn’t seem farther away from the city, and it makes the perfect base for a visiting cyclist. The roads are quiet, the terrain offers everything you could want for a bike trip, and there are so many route options that you’ll always find something new to explore. We put our man Ted King on the job of making sure we hit all the classics this region has to offer, as well as tapping into his local knowledge for some undiscovered gems. 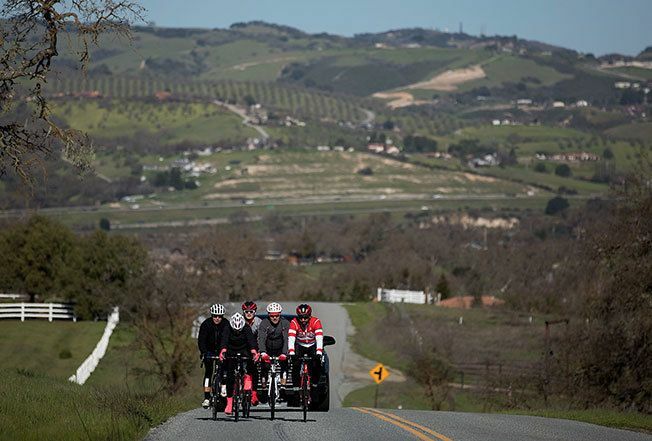 For this California wine country adventure, we’ll explore the roads around Healdsburg and everyone’s end-of-the-season fitness will be put to the test on the climbs up Fort Ross and Coleman Valley, on the same roads used for the very first stage of the 2012 Tour of California. We will also pedal long, rolling miles following the Russian River. It won’t all be work though, because we also plan on feasting like royalty and sampling some big California Cabs as well local Pinots, Chardonnays and Zinfandels. *Lodging is not included in this trip. We have reserved rooms at h2hotel in Healdsburg for your convenience. Sonoma can be enjoyed in a variety of ways and we’ll kick off the long weekend by pedaling adjacent to some of its best wineries weaving along its most scenic roads. Quickly making our way out to West Dry Creek Road, this strip of fresh tarmac weaves its way north and into quintessential Healdsburg riding. Turning east at Yoakim Bridge, we’ll then see the only climb of the day a gradual ascent to Geyserville and an easy roll back to our abode. The Grasshoppers are a fixture of Sonoma cycling. A series of mixed terrain rides-slash-races, now in their twentieth year they were well ahead of the trend when they started in the gravel scene. One of Ted’s first experiences with ‘hoppers was a close derivation of this Geysers route. Setting out north along Dry Creek Road, we’ll pass the popular Dry Creek General Store, onto Cloverdale, and then start the true adventure when we begin Geysers Road. The road snakes besides Big Sulphur Creek and Truitt Creek on a road that will see nary a car, before a few switchbacks have us crest Geysers Road and sweep downhill back into the Dry Creek Valley. Don’t be deceived by the name Pine Flat, a more accurate title name would be Pine Sinuous Mountain Climb Road. This lonely strip of pavement offers a spectacular view its entire way skyward. And because it's an out and back, you’re free to call the climbing good for the day at any point and enjoy the descent to the valley. From there, we can opt for a 0.3 mile detour to the popular lunch spot, the Jimtown Store. Next we’re off to Chalk Hill Road, bursting with equal parts productive viticulture and photo worthy spots, it’s then a short way home from the town of Windsor. Anyone who comes home from riding in Sonoma will somewhere have collected “the fish was THIS big!” yarn that was spun somewhere along Fort Ross Road or the subsequent plunge down Meyers Grade. Setting off south along West Dry Creek Road, we’ll soon be dwarfed by towering redwoods pedaling towards the bohemian town of Cazadero. Mirroring the 2012 stage one from Tour of California, when Ted had the pleasure of pulling the peloton along this stretch knowing that the elastic effect was ferocious to those behind. His team went onto win this stage, starting with that magnificent sixty mile leadout. From Cazadero, the road makes its way up thanks to a series of seemingly countless rollers along Fort Ross Road. At last we’ll emerge onto Meyers Grade where the smell of the ocean is met with one of the best descents in California. With options to take a flat route home again through the redwoods or continue south with a short, but abrupt assault of Coleman Valley Road, each route has a friendly final pedal back to Healdsburg. A perfect summary of the past few days, the final shakeout ride sees only one very brief climb over Dutcher Creek Road. Descending into the petite town of Asti, we’ll parallel Russian River for most of the ride home with an optional coffee stop in Geyserville, at the famous Jimtown Store, or we can simply pedal back in Healdsburg to one of our favorite spots, the Flying Goat.